One of the biggest problems faced by diabetic patients is the huge amount of dietary restrictions that they have to face owing to which the food that is cooked for them is generally not that tasty. But with the advent of new and healthy recipes this problem is slowly on the verge of its extinction. Many chefs and food specialists across the world have come up with many modern recipes that are specially designed for the diabetic patients. Needless to say these recipes are not just healthy but also extremely tasty. 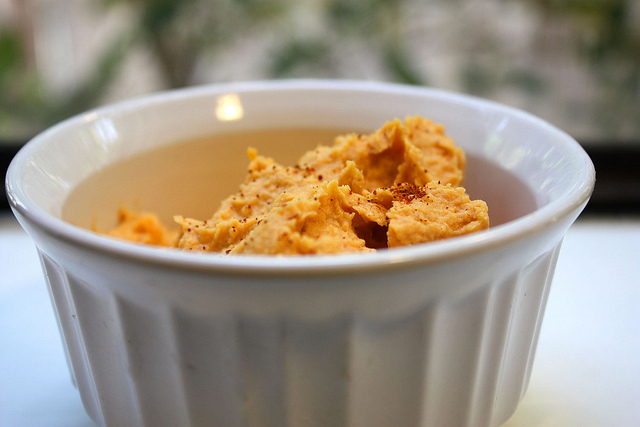 One such recipe is the spiced sweet roasted red pepper hummus. This is an excellent alternative to the popular dips that have a high calorie count. This dish tastes absolutely incredible when served with pita bread. In order to obtain a greater variation of texture in the dish, the pita bread can be cut in the shape of wedges and dry roasted . It is important to roast the bread slices rather than frying them to ensure that no extra fat is introduced in the dish. Ingredients for spicy roasted red pepper hummus. 2. Tahini (This is sesame paste and can be easily found in the Mediterranean section of any food store) – 2 tablespoons. 1. Roast the red peppers directly in the fire till the outer skins attains a charred hue and gets blistered. 2. Once perfectly roasted put the peppers in a covered vessel and leave it to rest for minimum 15 minutes. This induces a vibrant smoky flavour to the dish. 3. Once cooled peel of the outer charred skin and discard the seeds and the stem from the pepper. 4. Take a food processor and put the canned beans, roasted peppers, tahini, garlic, salt, oil, ground cumin, lemon juice along with water and blend till the mixture attains a smooth and creamy consistency. 5. After the desired texture is attained transfer the hummus to a serving bowl and refrigerate it for one hour. Hummus made in this way can be stored up to three days. 6. Before serving take the hummus out of the refrigerator and let it sit till it attains the room temperature. Finally garnish it with chopped parsley and serve with roasted pita wedges. Nutritional information of the dish. A quarter cup serving of the spicy roasted red pepper hummus has the following nutritional benefits. This dish is excellent for diabetic patients owing to the choice of ingredients. Firstly, chickpeas which forms the base of the hummus is a great source of fibre and contains magnesium, calcium, folate and potassium. Not only do they help in controlling the level of blood sugar but also facilitate in improving the heart and reduce levels of cholesterol. Secondly red peppers are high in both Vitamin C and Vitamin A. Finally tahini, which is actually made up of sesame seeds is an excellent source of magnesium and copper. Hence it is not essential that healthy food cannot be tasty. By consuming healthy food that have such high nutritional benefits one can not only keep diseases at bay but can also satisfy their taste buds. Along with following a healthy diet to maintain health it is also important to be financially prepared for treatment on account of any emergency health situation. The best way to deal with such a situation is to apply for a European health insurance card( EHIC Card) which covers all expenses incurred in emergency healthcare in Europe. It is also important to note that as both EHIC application and renewal can be done online, this procedure can be completed very easily.